The impossible people who make life’s journey so difficult are everywhere—at the office, in restaurants, on airplanes, living next door, members of your own family. They’re . . .
Ron Shapiro and Mark Jankowski give you a simple and highly effective 4-point plan for dealing with all of them and more—N.I.C.E. Their system shows you how to neutralize your emotions so you don’t just react but act purposefully and wisely. 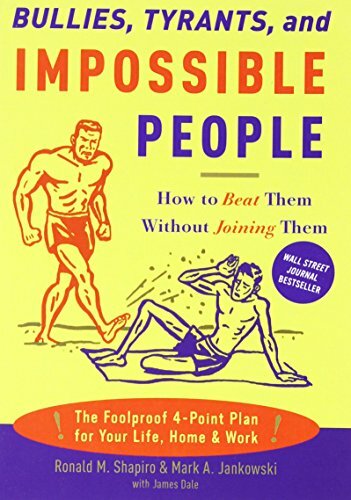 It enables you to identify the type of bully, tyrant, or impossible person you’re facing—the situationally difficult (something has happened that turns an otherwise reasonable person into a temporary terror); the strategically difficult (she has empirical evidence that being difficult is a strategy that gets results); or simply difficult (being difficult is his 24/7 M.O.). Then you’ll learn how to shape the outcome by controlling the encounter and, finally, how to get “unstuck” by exploring your options. Using colorful stories from all walks of life— “He called me the scum of the earth and it went downhill from there,” “First, lock all your vendors in a small room,” and “The boss from hell”—the authors bring their lessons to life, from business life to family life.